Lack of human touch is a major problem for frail or ill elderly people. It causes negative feelings of anxiety, isolation, loneliness and lack of trust in their caregivers. Hand and arm massage is quick, relaxing and provides immediate health benefits, such as improved range of motion for fingers and wrists, improved circulation and reduction of trigger points in hand muscles. It also relieves stress and anxiety as well as promoting sleep. As little as five minutes of hand massage has been found to reduce cortisol levels and produce a physiological relaxation response. Gently pressing the palm and rubbing the knuckles in therapeutic motions has helped dementia patients reduce their agitated behaviour during morning care routines. 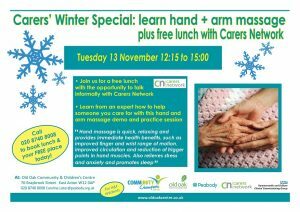 This practical demonstration and workshop will give you the skills, knowledge and confidence to help the person you care for. Touch can also be a good way of communicating that you care. 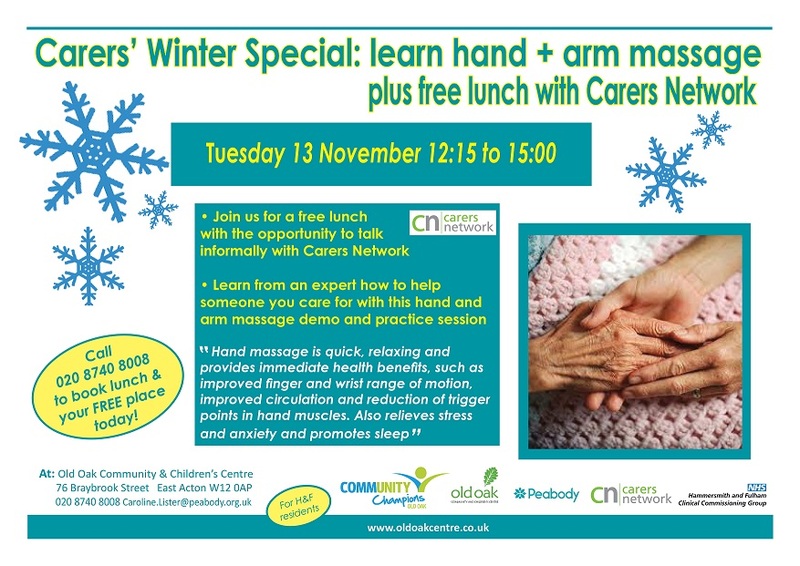 Before the workshop, we invite you to join staff from Carers Network to talk about the support and information they offer over a relaxing light lunch from 12:15 to 13:00 when the massage workshop starts. This event is free but please do call Caroline on 020 8740 8008 to book your place and let us know any dietary requirements for lunch. Old Oak Community Centre is easy to find (Click Here for a map): take Central Line to East Acton Station, exit station and turn left along Erconwald Street and walk to end, turn right into Braybrook Street, cross road and Centre is on your left. The Centre has step-free access throughout.